In our last blog, we were pleased to report on some very successful results from our hospital’s raptor rehabilitation program for 2010. The year just gone was an eventful one in lots of ways and we thought it would be an idea to recapture one or two of its highlights. The beginning of the year saw the completion of the new falconers’ huts, providing new, updated mews, food preparation room, weighing room, incubator room and general office. Now, a year later and decked out with all the requisite falconery paraphernalia, they have seen us through blazing summer sun and wintry blasts and still look as good as new and are functioning well for the purposes intended. Spring is always an exhilarating time, when the Sanctuary starts to come back to life. There’s definitely a buzz in the air as the flying display team birds are reclaimed, ready for the summer season and preparations are made for the new catalogue of events. We're a couple of weeks off from that for this year, but it won't be long before that feeling of anticipation returns to the Sanctuary. We had an exciting program of events in 2010, beginning with our popular Mother’s Day photo-sessions in March and an Easter week full of events for visitors, the young ones in particular. All through July and the summer holidays, we ran our ‘Summer Sunday Specials’, including the Funforce Crew teaching circus tricks like hula-hooping, tightrope walking, plate spinning and limbo dancing. We also had brilliant Bouncy Castle Days, face painting and lots of good old fashioned fun with Punch and Judy - all providing some additional entertainment for the families who who made a day of it in the company of our owls and other fascinating birds of prey. Undoubtedly our most popular and remarkable extra attraction, however, was Jenny’s Ark Pet Zoo, who set up camp with us periodically through the holidays. Jenny has an astonishing array of animals, everything from giant millipedes, to inquisitive goats and even our youngest visitors can’t resist the chance to hold a slithering boa or feed the ever-ravenous rare sheep. Our older visitors are also by no means immune to the draw of the wild and who doesn’t like a quiet cuddle with a cute, fluffy bunny? We have had many enquiries about Jenny’s Ark since her last visit back in August and are pleased to announce that she and her entourage are once again firmly on our list of events for this year! Of course, no summer visit to the Sanctuary would be complete without the superb flying displays, where visitors have the chance to see some of the world’s most stunning birds of prey stretch their wings as they swoop, stoop, glide & soar in the skies over Stonham. 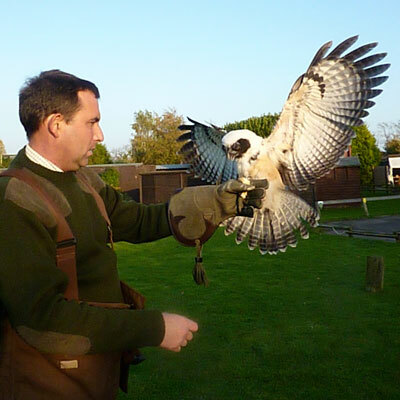 Displays begin on April the 9th this year, but visitors can also see the falconers exercising the birds daily as they up their fitness levels during the next couple of months. Pleased to Meet You (2) Andy and one of the youngsters a little later in the year - "My, how you've grown!" Our education team worked hard to update the education package last yar and the response by teachers and children was really positive and enthusiastic. Our new teacher pack was also very well received, providing lots of fun and informative activities for kids and plenty of information for teachers. (there can be downloaded from this website - see here for details.